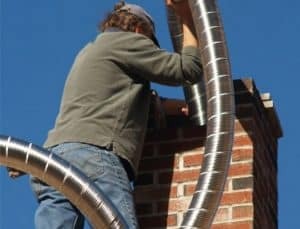 A flue lining in a masonry chimney is defined as "A clay, ceramic, or metal conduit installed inside of a chimney, intended to contain the combustion products, direct them to the outside atmosphere, and protect the chimney walls from heat and corrosion." Although building codes vary from one state or locality to another, the installation of flue lining has been recommended since the early part of this century, and indeed most fire codes now mandate liners. In the 1940's and again in the 1980's, masonry chimneys were tested by the National Bureau or Standards for durability due to rising concerns about their performance and safety. The tests revealed that unlined chimneys were so unsafe that researchers characterized building a chimney without a liner as "little less than criminal"
3) Liners provide a correctly sized flue for optimum efficiency of appliances. Modern wood stoves and gas or oil furnaces require a correctly sized flue to perform properly. The chimney is responsible for not only allowing the products of combustion a passage out of the house, but the draft generated by the chimney also supplies the combustion air to the appliance. An incorrectly sized liner can lead to excessive creosote buildup in woodburning stoves, and the production of carbon monoxide with conventional fuels. 1) Clay tiles are the most common type of masonry chimney liners. They are inexpensive, readily available, and perform quite well for open fireplace chimneys that are properly maintained. There are two disadvantages to clay tiles. The first is that, being a ceramic product, they cannot rapidly absorb and evenly distribute heat during the rapid temperature rise that occurs during a chimney fire. This uneven heating produces an unequal expansion which in turn causes the flue tiles to crack and split apart. This is similar to immersing a cold drinking glass in very hot water. It will instantly shatter. A chimney with cracked chimney liners must be repaired before use. The second disadvantage is that tiles cannot adequately contain the liquid combustion byproducts produced by modern gas appliances. 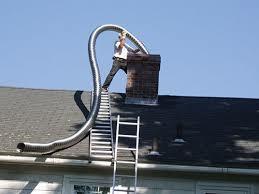 2) Metal chimney liners, usually of stainless steel or aluminum, are primarily used to upgrade and repair existing chimneys. These liner systems are U.L. tested and listed, and if properly installed and maintained are extremely safe and durable. Stainless steel is suitable for woodburning, gas, or oil applications, while the aluminum is an inexpensive alternative for certain medium efficiency gas applications only. It is usually required that high temperature insulation be used in conjunction with the liners for safety and performance considerations. 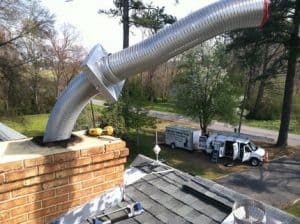 3) Cast-in-place chimney liners are lightweight, castable, cement like products that are installed inside the chimney forming a smooth, seamless, insulated passageway for the flue gasses. They can improve the structural integrity of aging chimneys, and are permanent liners suitable for all fuels. Considering the dangers of old unlined or damaged chimneys, and the many cost effective options now available to make these chimneys safe components of the home heating system, may we suggest you have your chimney professionally inspected to be sure it meets modern safety standards.